In February of 2017, Ensemble Dal Niente premiered Swan, a sprawling piece for seven musicians and electronics. Here, flutist Emma Hospelhorn and composer Murat Çolak take us behind the scenes. Which came first, the piece or the title? What are the central themes/ structural elements of this work? "Swan" existed as a concept long before I wrote the piece. About a year ago, I was working on some dance music - a downtempo track with an extremely emotional chord progression and warm, sweeping synth stabs. I was imagining it as the soundtrack to a fashion photo shoot. I named it Swan, imagining an elegant, charismatic creature floating on the water, alone. The swan is iconic, it has personality and vibe. It has power. Being fancy, being as beautiful as a swan in a rough world is power to me. In (the new) Swan, I wanted to focus on the music I am passionate about, on the culture I am passionate about. And the imagery too - every single part of this piece comes directly from my experiences, from my artistic, spiritual, and social identity. Swan is an emotional piece. It was challenging to write, because I think of this piece (for the most part) as a farewell to my previous, mostly-borrowed, practices. I am claiming my own space. I thought it would sort of pull me away from the community I’ve belonged to for the past seven-eight years because, you know, this is fancy music: it is pop, it is beautiful, it is like a swan. In this sense, I think Swan embodies the power I see in the iconography that inspired it. To answer your question more directly, Swan is not a thematic work. It is beautiful and fancy; it is pop, it is new, it is music. The score comes embedded with several really cool images, including a calligraphic tiger. We performed the piece alongside a video created by Dan Tramte. Can you talk a bit about your inspiration for the visual imagery of this piece, and how the visuals fit in with the sound world you've created? The images are a kind of collection of the things and the world that inspired Swan. The collection included a calligraphic lion (I am a big fan of felines - like swans, they are charming, charismatic creatures) by the Turkish calligraph Ahmed Hilmi, another calligraphic lion titled ‘The Lion of God (Allah)’ symbolizing Caliph Ali (Ali is aka ‘The Lion of God’ in Islamic literature), a calligraphic swan titled ‘The Swan’ by Yahya Muhammad which is a Basmala/Bismillah [‘in the name of God (Allah), the Most Gracious, the Most Merciful’ - the opening phrase for each chapter of the Qur’an, and the most commonly used motif in islamic calligraphy], beautiful swan pictures taken by my mom, some fascinating pictures of highly geometric details of Islamic architectural pieces taken by Eduard Wilmer, alongside some others. Prints of works by Hilmi and Muhammad come with the score as inserts since they were strong inspirations for Swan. From the above, you can probably tell that I am fascinated by Islamic visual arts and how animal figures function in them. Islamic art is not representational. A swan is beautiful, a lion is beautiful, but they are only meaningful because they ‘are’, because they exist as realized visions of the Creator. Attempting to replicate a creature with technical realism, artistic or otherwise, is considered to be “shirk” (idolatry, polytheism). 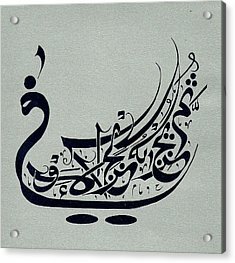 So instead, one might present the creature through pictographic calligraphy which, most of the time, reads 'Bismillah', 'Muhammad' or ‘Allah.’ The animal figures themselves are aesthetic-spiritual concepts. Though I am not practicing religious iconoclasm, I too am uninterested in the narrativity of my images. They are there for vibe, they are there for spirit. I am simply and singularly interested in their beauty. I worked on the concept videos with Dan Tramte (a composer/multimedia artist and a good friend of mine). I’d been following his work for awhile, especially on his social media accounts (which he successfully curates as artistic media), and from a stint in January when we worked together in our close friend/collaborator Marek Poliks’ interdisciplinary show The MAW. Dan had made live video for that show, and I (all of us) loved his work. And since day one, I had been thinking of expanding the medium of Swan. So I talked to Dan, showed him the images I had collected, and he came up with these amazing videos. So, yes, the short videos mark the sections of Swan, ground the piece’s conceptual and spiritual content, and (most importantly) contribute to the world / the vibe of Swan. We are debating adding more video in future shows. The electronics in this piece are like nothing I've ever experienced. They included field recordings, sonic sculpture, and a bona fide trance track. How did you create the electronics? I'm asking this both in terms of structure and as a sort of semi-tech-literate person who really wants to know, like, HOW you made it. cadences to a highly processed “tilâvet” (the Swan) which was recorded during an actual funeral ceremony in the summer of 2016. I worked on the electronics and the score simultaneously. So, neither came first, it was a single process. I produced, mixed and mastered the electronic part (and the recording of the performance, too) completely digitally in my digital audio workstation. Materials varied from hardware and virtual synths to sample libraries, from little studio recordings to field recordings that I found/made. I also made patches for an analog monophonic synthesizer which the pianist (Mabel) played. This piece was a big learning experience for me, not only in terms of electronic music production, but specifically the techniques and technologies of writing for live instruments and electronics. Followup question: how do you see the relationship between the sounds produced by live (mic'ed) instrumentalists and the electronic sounds? At one point during rehearsal you said that we (the band) were "an acoustic ring modulation." Can you talk more about that? The electronics give Swan its world. They bring virtual space, they bring vibe. But this world is lifeless without the performers’ presence. Without them, it’s just a maquette. You guys are the life in the Swan-world; you are the force that makes it a real place, that turns the maquette to real music. Swan might also take the new music performer out of their comfort zone. The performers play rhythms, chords, melodies, and their efforts are subject to the constraints and exposure of a strict time grid. Though the parts themselves are not too complicated to execute or understand, a single flaw can feel extremely visible. Further, I am asking the performer to really understand these materials through the aesthetics of the Swan-world. Swan’s history clashes with the history of the western concert performer. So I think there is a little adjustment, or at least a little productive tension. Ring modulation is basically the multiplication of two electronic signals with simple waveforms. The result is a metallic, bell-like sound with inharmonic over- and sub-tones. Towards the end of Karaoke Mahshar, I introduce ring modulation in the synth pad, so it gets more and more metallic/inharmonic/detuned. The ring modulated pad also opens Rod Modell and sustains for a while. What I did in the instrumental part was to slowly introduce held out-of-tune tones while introducing microtonal-inflections in the ensemble melody. The beatings, difference/combination tones imitate and extend the ring modulation in the electronic part. Did any new compositional directions arise for you through your work on this piece? The very next project is an approximately 10-minute long piece with amplified instruments, electronics, and synthesizers, similar forces with Swan. I’m writing it for this year’s MATA Festival. It’s titled ‘Orchid’. I am working with the aesthetics of Swan, but probably pushing toward an even more ‘Turkish’ place. After that I’ll be preparing for an installation performance in Denmark. As I said, composing/producing Swan has been an invaluable learning experience. Things are getting clearer and clearer. One thing I tried with Swan was to create an artwork that is a show, an event, a thing by itself rather than simply a piece of music to semi-randomly appear on a new music concert. Swan should bring its own world - it should kind of curate itself. Curation and production value are really important for me, and I want to make them a priority in all of my collaborative work. My earliest musical crushes were people who balanced strong aesthetics with equally high-quality production values - people like Janet and Michael Jackson, Donna Summer, Sezen Aksu, Ahmet Kaya, Quincy Jones, Tarkan etc. These people are the reasons I decided to become a musician. My recent heroes, too, belong to the lineage of artists who practice this balance. Some names I can name are Rihanna, Young Thug, and Kanye (I have to insert Rod Modell, too, my favorite composer/ producer - I’ve even named the final section of Swan after him). These are very high standards, and ones that might feel impossible because of their high financial and logistical floor. Resources are much more limited when it comes to music that is more experimental. But we shouldn’t forget - our institutional affiliations give us opportunities that many aspiring artists don’t have (and that many of our most established artists today did not have at their outset). Given the privileges our musical community enjoys, I think that creating good production values is a kind of a responsibility, or at least I consider it every bit a priority as a strong aesthetic sense. That is to say, for future projects, I will devote as much of my energy to production and curation as I do to composition. Again, Swan was about ‘going out’. The door is now open for me and I feel like I can go (out) further. I want to keep composing/producing large scale works with a similar, an even more radicalized aesthetic approach. I’m planning to expand the media, and to collaborate with artists from other disciplines more often. I’ve been discussing/brainstorming several future projects with my collaborators for sometime now. Right now, we’re trying to find contexts (such as residencies) to work on both the art itself and of course the financial/ logistical side of things. Though these projects are still at the conceptual stage, I think I’ll be able to make some exciting announcements in a few months. Swan was performed on February 19, 2017, at Constellation Chicago. A recording of the live performance can be found on soundcloud.